To begin our week I have my fabulous Monday Morning Glamour most giving you a little glamour inspiration, and to help relieve any Monday blues. Today I have for your Jean Harlow, an American film star during the 1930’s! I also found these cute little vintage beauty tips starring Jean! 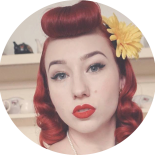 This entry was posted on January 16, 2017 by Miss Lady Lace in Monday Morning Glamour and tagged 1940's, 1950's, blogger, glamour, miss lady lace, miss lady laces pinup blog, Monday Morning Glamour, perth burlesque, perth pinup, perth pinup blog, perth pinup community, pin up, pinup, pinup blog, pinup blogger, pinup fashion, pinup girl, pinup life, pinup lifestyle, pinup perth, red lips, retro blog, retro girl, retro glamour, the perth pinup community, victory rolls, vintage, vintage blog, vintage blogger, vintage fashion, vintage girl, vintage glamour, vintage perth, vintage pinup blog.